﻿ Calibration Manual for IMCO Tonnage Load Monitors using Aircraft Grade Aluminum Load Cells and Certified Calibration Equipment. 2. Pre-calibration check of machine. 3. Pre-calibration check of Piezoelectric Transducers and Control unit. 5. Calibrate press member(s) (columns or pitman(s)). 6. Secure capacitors in control box by permanently soldering. 7. Check out Control unit activation. more than .0005 from each other. using light passes without coolant. projections likely to interfere with slide to bed parallelism. 2. Remove any knock-out pins. 3. Run slide to bottom of stroke. 4. Use accurate dial indicator to check that parallelism of slide to bed is within .0005.
plates be placed on top and bottom of load cell. limits of machine shut height. All piezoelectric transducers must be torqued to 15 inch/lbs. with torque wrench as supplied for any type of IMCO system. 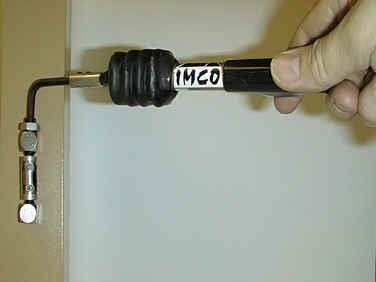 Insert hexagon end of torque wrench into top of screw socket as depicted in illustration IC500(A), and turn wrench clockwise as to tighten until distinct click is heard signifying suitable torque has been reached. Piezoelectric transducer is then properly torqued. Before starting to calibrate machine, plug in portable TON-INDICATOR at Signal Conditioning Box. Apply pressure to each piezoelectric transducer in turn by sharp jerk-type squeeze placing each piezoelectric transducer in dynamic compression (either by fingers or channel locks). Meter needle should rise, and if satisfactory response, check that piezoelectric transducer location is related to toggle switch position on signal conditioning box; i.e., switch on Signal Conditioning Box to right side, piezoelectric transducers on rear right housing (facing front of machine) gives signal on meter. Same for left hand side with switch on Signal Conditioning Box to left side. If, on squeezing piezoelectric transducer(s) it is noted that meter needle rises upon releasing pressure on sensor, wiring to sensor is reversed and incorrect. Recheck white to "A", black to "B" wiring. These checks will ensure that wiring from piezoelectric transducer to Signal Conditioning Box is correct. If incorrect, recheck wiring instructions. 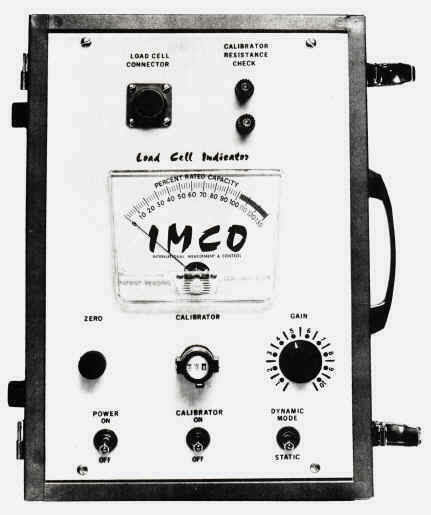 Before starting to calibrate machine with permanent unit, check that power light is "ON" at panel face, then carry out same preliminary checking procedure as for Portable Measurement, consisting of correct piezoelectric transducer(s) activation of meter(s) or digital display(s) that the piezoelectric transducer(s) location for left and right side columns or pitmans corresponds to designated left and right side meter or digital display activation. If calibration unit is set up correctly, machine alignment checked out and the piezoelectric transducers activation are satisfactory, proceed with CALIBRATION PROCEDURE. The following procedure and illustrations cover setting up of a single load cell connected to Load Cell Indicator as for calibrating a single point O.B.I. (two housings) or a single point Straight Side (one pitman). The procedure for a two or four point Straight Side Press is very similar. When setting up the load cell for a machine with more than one pitman we place Load Cell under one pitman and dummy(s) (solid block) under the other(s) to balance the applied load over all pitmans. Follow procedure for first pitman with live load cell, completing calibration in its entirety, then switching live load cell with dummy and vice versa, completing calibration of second pitman, etc. until all points are completed. load cell and spacers with first press stroke. identical height under other pitman to provide balanced load. 4. Connect Live Load Cell to Load Cell Indicator via load cell connector illustration IC502(A). to "OFF" and MODE switch is to "STATIC". 7. Turn POWER switch to "ON". Meter needle will rise. 10. Switch Calibrator to "ON", meter needle will rise from zero position. 11. Adjust GAIN control until indicator needle reads 100%. of zero by using zero control knob. 13. Repeat 10 to 12 once more. 14. Put MODE switch in DYNAMIC position. We can now accurately determine, visually, by readout of percent capacity meter on the Load Cell Indicator any load placed on the machine when striking the top surface of the Live Load Cell and/or spacer with the machine slide (ram), reflecting how hard the cell is struck. At the time of load, piezoelectric transducers having been pre-torqued, each to 15 inch/lbs., will undergo a physical change causing a discharge of electrical energy proportional to how hard the cell is struck. This energy output coming from across the piezoelectric transducer terminals is in turn transmitted to the piezoelectric transducer input terminals located within the control box or Signal Conditioning Box. Due to the energy output from the piezoelectric transducers being different from the energy output from the Live Load Cell, we are now required to "condition" the piezoelectric transducers outputs. The control meter or control digital displays contained in either the portable TON-INDICATOR or the permanently mounted CONTROL UNIT, will be made to read in terms of percent capacity for a meter system or direct tons for a digital system the tonnage at which machine is being calibrated, while at the same time the meter of the Load Cell Indicator should be reading 100%. First check that Live Load Cell, spacers, etc. have not shifted position in between the slide and bed; this should be checked periodically during calibration. 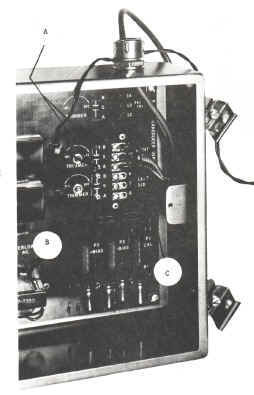 Connect Portable TON-INDICATOR to Signal Conditioning Box via Amphenol connector illustration IC504(A). Position so as to readily view meter readout of both TON-INDICATOR and LOAD CELL INDICATOR. Set toggle switch at front of Signal Conditioning Box to RIGHT side or if multiple position Signal Conditioning Box as for Four Point Press set switch to point number one. Open Signal Conditioning Box cover and connect the Capacitance Switch Box CSB-2 via alligator clips cross piezoelectric transducer input for RIGHT side or number one point of Signal Conditioning Box. 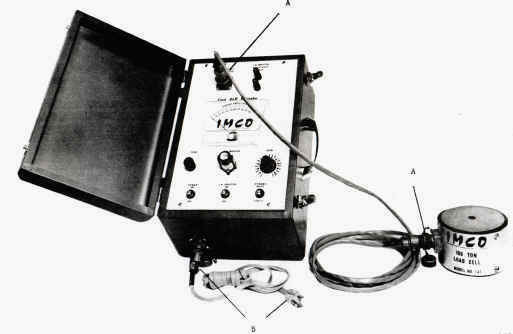 illustration IC504(B). Ensure all Capacitance Switch box CSB-2 switches are each on zero. With screwdriver, turn clockwise the variable capacity trimmer for right side located in Signal Conditioning Box just above piezoelectric transducer input terminals (do not force screw by over tightening) illustration IC504(C). Start slide in motion, reducing shut height in approximate .005 increments so as to slowly introduce increasing tonnage on live load cell by striking with slide face (ram). Slowly bring Load Cell Indicator Meter up to 100% reading, which based on Factor input chosen from Tonnage/Factor date sheet will represent a specific tonnage being applied to Load Cell and therefore machine members. Start press once again and check readout on control meter, and if it remains as close as previous when connected to Capacitance Switch Box CSB-2, insert screwdriver into variable capacity trimmer illustration IC504(C) turning counterclockwise to reduce 5-6% over range to obtain corrected percent capacity meter readout representing desired calibration tonnage. I f accurate readout cannot be obtained by variable trimmer, recheck capacitance total of Capacitance Switch Box CSB-2 or values selected. If readout is accurate, make sure capacitance is securely connected in position. Repeat procedure 1a - 10a for left-hand side sensor or other points. Remember to check frequently positioning of Live Load Cell, spacers, etc. beneath the pitman to avoid any walking action. When percent capacity readout from the portable meter correctly represents calibration tonnage for each individual member and the Load Cell Indicator meter also continues to read 100% for each, the calibration is complete. Set LOAD CELL INDICATOR in position so as to enable convenient readout of its meter and those meter(s)or digital display(s) on the permanently mounted unit on machine. 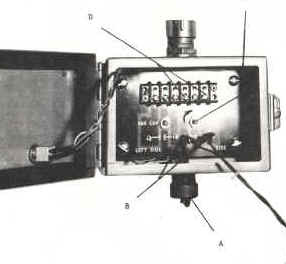 (A/C Powered TON-INDICATOR or TON-LIMIT DETECTOR). If unit is of single meter and toggle switch type set switch to RIGHT SIDE, check power light is on. Two meter or digital type requires no checking other than to assure power light is "ON". Open inner door of control by removing single screw on right-hand side. Connect Capacitance Switch Box CSB-2 with alligator clips to piezoelectric transducers input capacitance terminals for Right Side. illustration IC506(A). Ensure Capacitance Switch Box CSB-2 switches are each on zero. With screwdriver turn clockwise variable capacity trimmer for right side sensor inputs located just behind sensor input terminals. illustration IC506(B). Start slide in motion, reducing shut height in approximate .005 increments so as to slowly introduce increasing tonnage on live load cell by striking with slide face (ram). Slowly bring Load Cell Indicator Meter up to 100% which, based on Factor input chosen from Tonnage/Factor date sheet, will represent a specific tonnage being applied to Load Cell and therefore machine members. The Capacitance Switch Box CSB-2 represents the 9 standard values of calibrating capacitors repeated (3) three rotary switches. Use the rotary switches in any combination to select the exact capacitance required. Stop the press and select one or more combination of capacitors from supply box to achieve the total value needed, remove alligator clips from across terminals in control box, insert capacitor(s) by attaching across A & B terminal screws of appropriate sensor input. illustration IC506(C). Start press once again and check readout on control meter(s) or digital display(s), and if it remains as close as previous when connected to Capacitance Switch Box CSB-2, insert screwdriver into variable capacity trimmer, illustration IC506(B), turning counterclockwise to reduce 5-6% over range to obtain correct percent capacity meter readout or correct tons for digital readout, representing desired calibration tonnage. If accurate readout cannot be obtained by variable trimmer, recheck capacitance total of Capacitance Switch Box CSB-2 or values selected. When capacity readouts from control meter(s) or control digital display(s) correctly represent calibration tonnage for each individual member and the Load Cell Indicator meter also continues to read 100% for each, the calibration is complete. Set factor number in Load Cell Indicator. Slowly build up pressure on Load Cell in press be decreasing die space and striking Cell harder until Load Cell Indicator meter reads 100%. Tonnage at this point being exerted on Load Cell will be that shown next to factor number. 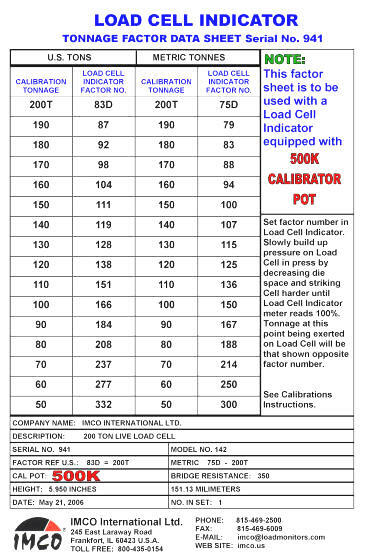 Determine your "factor" number by selecting suitable Calibration Tonnage that represents ratio of approximately 60-80% of machine capacity you are calibrating. Always work at 50% or better of machine rated capacity in tons but it is not necessary to work at 100% unless in low tonnage range presses. DO NOT EXCEED LOAD CELL CAPACITY. This can result in damage and subsequent erroneous calibration procedure. See reference for determining your factor number. Based on type press you intend to calibrate. Select a percent-age of its maximum capacity at which you plan to work. This percentage should always be 50% or more but is not necessary to calibrate at 100% unless machine capacity is in low tonnage range. For guidance the IMCO factory engineer endeavors to work at approximately 60-80%. Select factor number from TONNAGE/FACTOR data sheet, then compare the Tonnage listed opposite in the adjacent column as a percent ratio of the machine maximum capacity, making sure it falls within the limits specified in previous paragraph, but practical enough to be easily read on customer control meter. If percent ratio appears within limits, this will then be the dial readout percent you will be looking for on portable or machine mounted control unit. The readout on the meter of the Load Cell Indicator will always be 100%. 100 : 125 = 80%. Load Cell Indicator Master Meter should read 100% while customer control meter should read 80%. 45 : 60 = 75%. Load Cell Indicator - Master Meter should read 100%; customer meter 75%. 85 : 125 = 68%. Load Cell Indicator - Master Meter should read 100%; customer meter 68%. Calibrate at between 80 and 100% when tonnage gets really low to obtain best resolution. From these examples covering varied types of machines it can be seen that determining the factor is a relatively simple process and that when calibrating the Load Cell Indicator (Master Meter) should read that percent of machine capacity determined by the ratio of factor tonnage as to total machine capacity. When using dummy load cells as for two and four point presses, ensure that live and dummy cells are approximately within .005 of each other. Calibrate each point in turn using same live load cell and supporting other points with dummy cell(s).